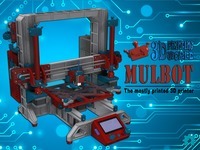 Melzi Board Case w/ Lids by 3DDOC is licensed under the Creative Commons - Attribution - Non-Commercial license. This Support Free Melzi Board Case should allow you to mount your Melzi anywhere you like using the extended legs. Using these for mounting to a surface, you can remove the case when working without having to remove the board itself. This will decrease the likelihood of damaging the board itself. The raised spacers inside will fully insulate the board from the mounting surface. Also, there are large openings for ALL Connections, including the Printer, LCD, SD and USB. The lids are mainly to prevent accidentally bumping the board or pulling on any of the connections. I have a fan directly over the board and so it's not an issue, but keep cooling in mind. COMPLETELY SUPPORT FREE. There is a small section of Bridging but most printers should be able to handle it without issue. Say thanks by giving 3DDOC a tip and help them continue to share amazing Things with the Thingiverse community. We're sure 3DDOC would love a Tip, but unfortunately they have not setup their accounts to receive them yet.